Summer is here, and that means it’s time to finally make an attempt at relaxation! 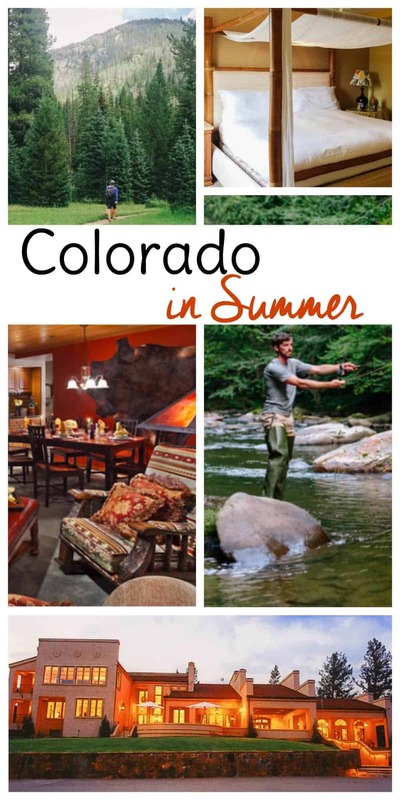 For families looking for an unexpected, off-the-beaten-path vacation spot, look no further than the great centennial state of Colorado! Normally billed as a place to only go during the winter for skiing, with its incredibly geographically diverse landscape of mountains, lakes, and more, Colorado has an unlimited amount of incredible things to experience this summer. From Winter Park to Keyah Grande, the travel experts at Natural Retreats have pulled together a comprehensive list of the top 4 Colorado towns to experience this summer, along with everything to do while you’re there, from delicious local restaurants to once-in-a-lifetime activities. Check out the list below for some fun finds! 1. Keyah Grande, Colorado: where refined elegance works in harmony with the natural beauty of southwest Colorado. This rental consists of a lovely two bed, two bathroom suite, decorated in a South Pacific style. Amenities in this home include and are not limited to an en suite bathroom with a jetted bathtub, fold out sofa bed, mini fridge, wet bar, ice maker, flat screen TV, and free wifi, a gas fireplace, and a patio/deck. Look out your west facing windows for gorgeous mountain views. While You’re There: We recommend heading over to Treasure Falls to search for the rumored treasure hidden on the mountain, or to simply admire the impressive waterfall. The family friendly Piedra River Trail is a must, and if your son or daughter is a budding artist, take them to the local Center for the Arts, for some live performances and fine visual art. Is Dad a history buff? Take a guided tour of Chimney Rock to truly appreciate the significance of this historic archeological site. After sunset, gather around the African-inspired fire pit on the property and recall the day’s adventures. Where To Eat: Get your nom on at some of these popular local restaurants! 2. Winter Park, Colorado: perfect for families, both for its close proximity to Denver and for the unlimited access to stunning mountain views and the great outdoors. This rental offers an amazing outdoor grill, fireplace, on-site parking facilities, decked area with outdoor furniture, and barbecue. A huge draw to staying in this home is the access to Rocky Mountain National Park, which is less than an hour away and is a great spot to view wildlife, hike, take a scenic drive or participate in a Ranger-led program. Lake Granby is an ideal hotspot for fishing, what with its abundance of trout all year long. Winter Park Flyfisher offer guests saying at Cascade Point (or any of the other Natural Retreats Winter Park homes) a full service experience. From equipment rental to a casting lesson from one of the experienced and patient guides, this certainly is a memorable and family-friendly activity. Winter Park is also notably the perfect base from which to explore the incredible Rocky Mountain landscape. The area provides unparalleled views of the alpine tundra region – an rare opportunity in national parks. For the adventurers in the family, try your hand at mountain biking through lush green scenery. Rent a bike and explore the Arapaho National Forest. A fan of upbeat jazz? Head over to Hideaway Park for the Winter Park Jazz Festival (July 16-17) for a weekend you don’t want to miss out on. The lineup will feature musicians such as The Isley Brothers and Anthony Hamilton. Or, hit up Trestle Bike Park for the Colorado Freeride Festival (July 28-31) for the largest freeride in the U.S. This festival welcomes a range of participants, from pro-athletes taking on highly difficult trails, as well as free family friendly activities and demos. Grab your bottle-opener on August 6th for the annual Winter Park Beer Festival, for a relaxing and fun day, complete with craft beers and live music. Where to Eat: From fresh baked goods to mouth watering barbecue, Winter Park has it all. 3. Aspen, Colorado: Aspen isn’t just where celebrities vacation, anymore. Now, you can experience this beautiful town, home of “The Aspen Idea,” a focus on Mind, Body and Spirit. This rental offers a whirlpool tub, steam shower, high-speed Internet, 2 fireplaces, state-of-the-art electronics, gourmet kitchen, and access to world-class St. Regis amenities, including the fitness center, resort spa, outdoor heated pool, and Splash, the resort’s unique pool lounge. While You’re There: Be sure your camera is charged for Maroon Bells, one of the most photographed spots in all of Colorado. Or, following the Roaring Fork River, the Rio Grande trail climbs steadily and offers 360 degree mountain views. Do you have a little scientist or environmentalist in the family? Learn about the unique Rocky Mountain wildlife and how to preserve it at ACES, the Center for Environmental Studies. If you want to find your zen, head over to John Denver Sanctuary. It’s a serene, beautiful setting with lyrics etched into surrounding rocks. End your trip in style with a show at the Wheeler Opera House – we promise, the acoustics will leave you speechless. Where To Eat: If you’re looking for some delicious food with beautiful mountain views, look no further than these highly ranked restaurants. This rental is designed with an open-plan in mind, with amenities such as a dining table, covered balcony with mountain village views, jacuzzi tub, steam shower, washer and dryer, as well as access to a fitness room, hot tubs, a communal gas grill barbecue, and a heated indoor/outdoor pool. While You’re There: Fish Creek Falls is a lovely hike year round, and afterwards, relax in the natural Strawberry Park Hot Springs — complete with a gorgeous view. If you’ve never been on a cattle drive, now’s your chance at family owned Saddleback Ranch, where there’s always something going on. Or, get out and explore the vibrant culture of this cowboy town in Downtown Steamboat Springs by taking the peaceful, paved Yampa River Core Trail. It runs right along the Yampa River next to town. If hiking into town isn’t your scene, you still shouldn’t have to worry about directions or gas while on vacation: access to restaurants and downtown Steamboat Springs is that much easier using Chataeu Charmonix’s private on-call shuttle service. Where To Eat: Make some time in your vacation to dine at one of these amazing culinary experiences! « Easy Cat Toys to Make from Wine Corks!